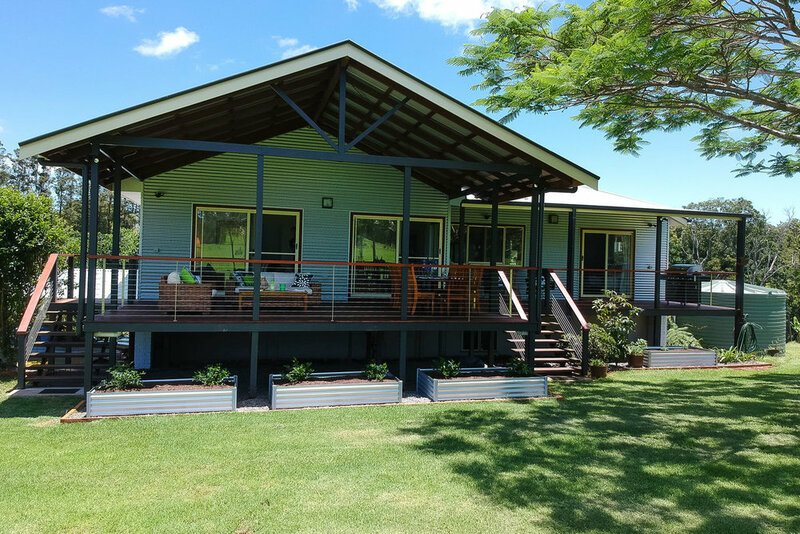 The recently renovated 5 bedroom, 3 bathroom home has a massive covered deck overlooking a tranquil rural view, all tastefully designed for indoor & outdoor living. Upstairs are four bedrooms and two bathrooms plus a modern kitchen equipped with all the appliances and utensils a gourmet cook would desire including dishwasher. There is a wood burning heater and reverse cycle air conditioner. A flat screen TV sits in the corner if you get tired of the view which is unlikely. Free WiFi throughout the house. The Main Bedroom has a king bed, en-suite including toilet plus a large spa with shower over. The Poinciana Room has twin beds which can be pushed together to make a king. The Green Room and Red Room have queen beds. The Main Bathroom has a shower plus full size bath. A separate toilet is adjacent. Downstairs is a spacious fully contained studio with king bed, lounge, bathroom and kitchenette. Additionally there is a second spacious living / media room with large flat screen TV. There is also a coffee table and two fold out sofa beds plus dining table and chairs. In a laundry cupboard is a washing machine, dryer and ironing facilities.